Happy Nonfiction Monday! L.L. Owens has got the roundup, so head over there to see what nonfiction the Kidlitosphere is reading this week. I'm going to a school this week to do some booktalks and they requested some materials for Women's History Month. I did similar booktalks last year, but here's what I'm taking this year. 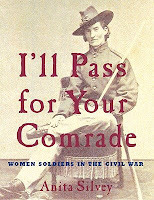 I'll Pass for Your Comrade by Anita Silvey. During the Civil War, women were not allowed to fight, but many of them donned men's clothes and joined the army anyway. They had lots of reasons - some followed husbands or brothers, some wanted the bounty given to soldiers, and still others were so passionate about the cause that they felt compelled to do their part. In I'll Pass for Your Comrade, we learn how women disguised themselves, how they kept their secrets, and what happened to them if they were found out. The text is highly readable and it's accompanied by tons of great photos that bring these women to life. This is a great one for history buffs. You Wouldn't Want to Be a Suffragist: A Protest Movement That's Rougher Than You Expected by Fiona MacDonald. Think you know about American women's fight for the right to vote? It may have been a lot rougher than you think! Women went to great lengths to make their voices heard. Some set fire to mailboxes or assaulted police officers; many spent time in jail. 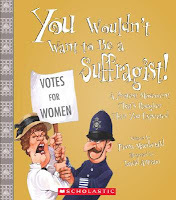 This cartoon history gives an overview of the struggle for suffrage and many of the women who fought for equal rights. 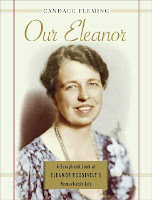 Our Eleanor: A Scrapbook Look at Eleanor Roosevelt's Remarkable Life and The Linco lns: A Scrapbook Look at Abraham and Mary, both by Candace Fleming. Okay, there are lots of biographies of Eleanor Roosevelt and of Abraham Lincoln, but these books are pretty unique. They're each done in a scrapbook format, collecting lots of little stories and anecdotes like you might in a scrapbook. The thing I really like about this is that you can skip around and read the parts that interest you. Eleanor Roosevelt is obviously a very important woman in history. And I include a book about the Lincolns because Candace Fleming's written a book that puts the woman back into the story. 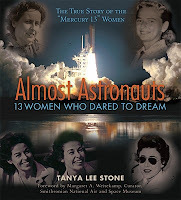 Looking for more books for Women's History Month? Check out the Amelia Bloomer Project and Wild Rose Reader's list of resources. I am making a list of these books. When my daughter and I read her history book together, she often asks, "But what about the girls?" We have found some titles on the contributions women have made in history, but we're always looking for more! These look like great books for our school library. Thanks for highlighting them!